More than comedy, more than juggling, more entertainment than you'd expect from two performers…it's Comedy In High Definition®. Mark and Marlo have been featured on the Late Show, America's Got Talent, and Who Wants to Be A Millionaire - Mark's even won a Guinness World Record. Their clean, Vegas-style production is packed with humor that will have your audience rocking in their seats with laughter. Think "Looney-Tunes-In-Anti-Gravity-Mode". 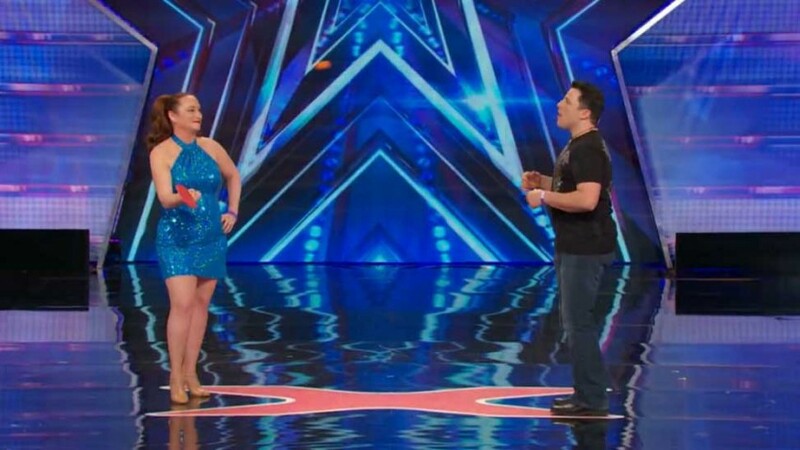 Seriously, we can't count how often people have said, "I NEVER thought juggling could be cool, until now!" Not sold yet? Watch the promo video now to see what sets this show apart from the sea of other comedians and variety acts available today. Mark animated the crowd, and impressed everyone! Mark was such a marvelous addition to our Carny-Ville themed event!! He animated the crowd and impressed everyone with his juggling, unicycle and fire skills!! He was such a professional ( and a nice guy, too!) you won’t regret hiring this guy!! Thank you, BJ, for including me in such a memorable evening. Your production was certainly the biggest draw at the event, and it was an honor to be able to contribute to it. 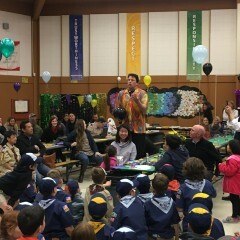 We hired Mark and Marlo for a Cub Scout Blue and Gold Dinner. It was amazing! People of all ages loved the show! We also had a great juggling lesson for the kids that was a blast. Mark and Marlo wowed us all!! 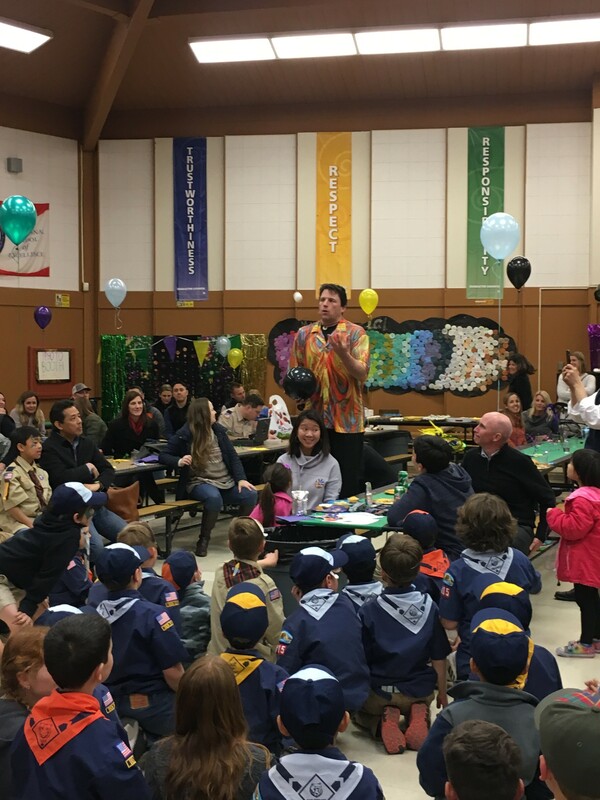 Thanks, Maggie, for allowing us to be a part of pack 508's festivities. So glad everybody enjoyed watching the show as much as we had performing it! I had a last minute entertainment crisis to fill in two weeks for my 40th birthday party. Mark responded quickly to my Gigsalad request. He understood my delimma and even accommodated me around our schedules. To be honest, I wasn't sure if this type of act would be taken well with my party attendees of adults. Mark and his wife/assistant Marlo were very entertaining. They were personable and talked with everyone at the party. They were funny on top of the various acts, proving that juggling isn't just for kids. They were interactive with all the guests and there was never a dull moment. I would highly recommend them for your event. Thank you for making my event memorable! Thanks for having us, Jen! So glad we could make the big four-oh a bash to remember. You have a wonderful group of friends...really up for anything (especially Kim.) I hope we have a chance to help you or them make another event one for the books. Having Mark Angelo and his juggling add the perfect touch to our office family picnic. Not only was his program exciting for all ages we also had him give us a few lessons on juggling. Wonderful and engaging, playful and fun! I would highly recommend him for your next gathering. I know we will be having him back! We loved the tricks! The kids were so excited. We had a large group and Mark was super friendly despite being squirted with water guns and having our dog follow him around! He's the best. Mark performed at an Awards and Fun Day event involving 200 people in a pavilion in a park. The students and their parents were very impressed with the juggling that Mark did, but even more impressed with how he got everyone involved. He was a great addition to the event. So, you think you know what to expect from a comedy juggler? Think again. Mark Angelo detonates the image of what a juggling act "normally" is... and in nuclear fashion! 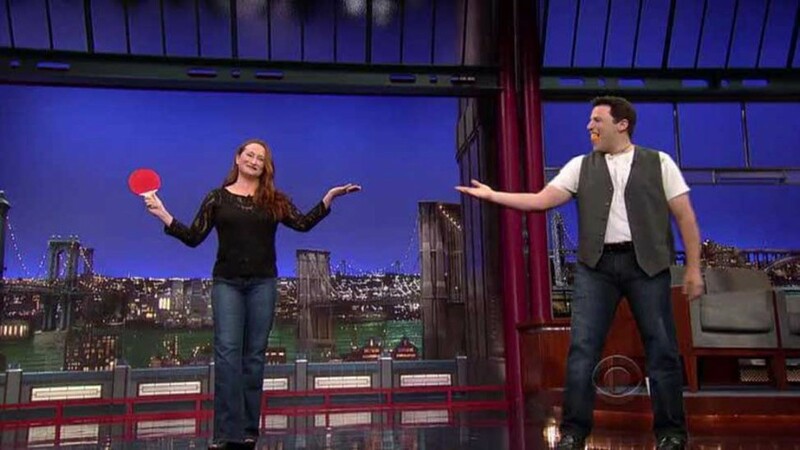 Featured on the Late Show with David Letterman, Mark (along with his radiant wife, Marlo) makes your event stand out by delivering a show that is not only packed with rock-solid skills...it also delivers energy and laughs that will spread through your audience like wildfire. You'll see things you can't find anywhere but here - things like the exotic Chinese "Dragon Wing" dance, bullwhips that shred innocent party favors, and ping-pong balls that zoom thirty feet in the air. Not only are you getting a fantastic show...it's customizable. Mark can tailor a show to your event or message, with CLEAN comedy and stunts that totally engage your audience...whether on stage, or performing "immersion-style" amongst the crowd. With more than twenty years of creating moments of wonder and hilarity both at home and internationally, you can feel confident that Mark knows what it takes to take your event to the next level. So be warned: Mark Angelo can turn your world upside-down. So many people have walked out of the theater at the end of the show, thinking "I NEVER thought that juggling could be cool...until now!" So, what have Mark & Marlo done, and where have they been seen? Well, for starters, they've appeared on numerous national television shows, including: "America's Got Talent", "The Late Show" on CBS, and "Who Wants to be a Millionaire? "...in addition to being featured on Chinese national television! They have performed for a wide range of corporate clients, like Nestle, ALCOA, Sea World, Goodyear, Lubrizol, and Rubbermaid. Cruise ships? Yep...by the boatload - Princess Cruises, Royal Caribbean International, Holland America Line, Disney Cruises, Norwegian Cruise Lines, Carnival Cruises, and Celebrity Cruises. And let's not forget that Mark is a 5-time Gold Medalist in the International Juggling Association competitions, as well as a winner of a Guinness World Record!